The Homemade Almond Milk post I wrote last month is one of the more popular things I've published in a while. So, I thought it would be fitting to do a quick follow-up on a spankin' new method I'm using these days that has transformed the process for me. Full disclosure: I am not the first person in the world to use this method . . . but I honestly (!) came up with it on my own on the long car ride back from our beach vacation. I thought I was brilliant. 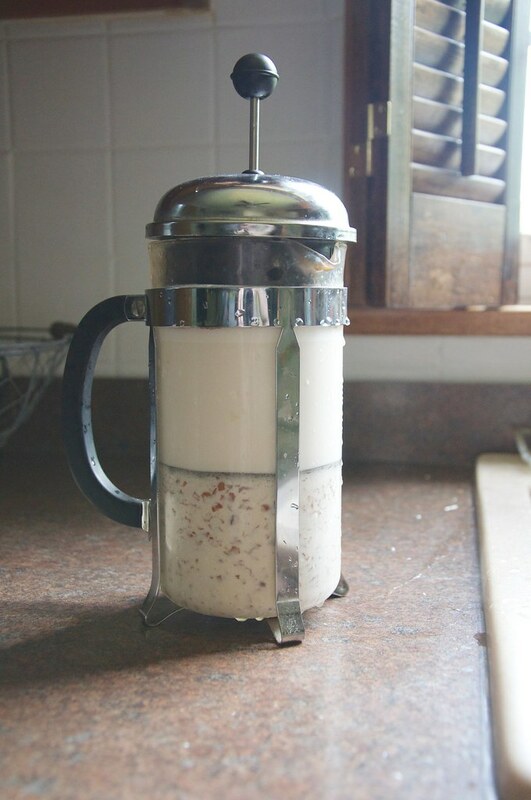 I came home, looked it up, and see that m.a.n.y other people also choose to forgo the messy cheesecloth squeezing and seemingly superfluous nut milk bags and -- instead -- use a French press for a simple straining solution. Well, you follow the exact same instructions from the Homemade Almond Milk post (there's a recipe for a tasty chocolate almond milk drink in there too!). But instead of pouring tirelessly in little batches into the cheesecloth and squeezing . . . you pour as much as you can into a French press and, well, PRESS. Press hard. I had to do mine in two batches, but the milk squeezed through the metal mesh so well. I had the same, dry almond pulp left to put in baked goods. And the same creamy beverage to enjoy. Bonus? Afterward, you can rinse + make coffee with your French press and combine the two for a heavenly treat. 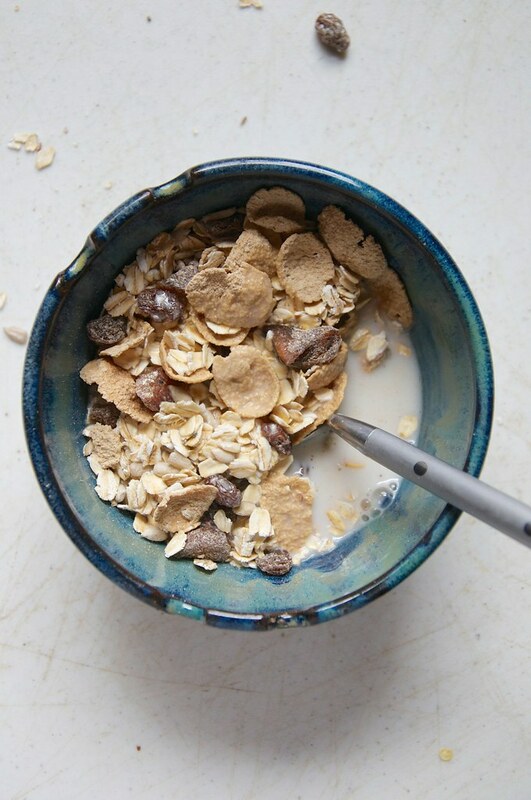 Or -- my favorite -- pour into Homemade Muesli! How else do you use a French press? I've read it makes rinsing quinoa quite easy and can even be a good solution for infusing cooking oils with herbs/etc. I love finding simple kitchen-hacks using stuff we already own! Stephen doesn't like when I constantly use his favorite coffeemaker, though, so I may need to get a new one just for me. I like this compact 3-cup press, which might be perfect for smaller jobs.